A relocation does wonders for the bottom line. You can make a lot of good arguments for why an NFL franchise with longstanding ties to its community shouldn’t relocate. However, it’s extremely hard to deny the fact that relocation almost always has a significant effect on the pro football franchise’s bottom line. And ultimately, that’s all most owners care about if we’re being honest. You can see this all play out pretty clearly by comparing Forbes’ latest NFL franchise valuations, which they released on Thursday, to their values from just five years ago. At first glance, not a lot looks different (except for much higher numbers). The Dallas Cowboys remain the most valuable franchise in football. Not only that but their value, at least according to Forces, has more than doubled in that time from $2.3 billion to $5 billion (which explains, in part, why Jerry Jones doesn’t care what you or anyone else thinks). The New England Patriots follow them, just like they did five years ago, with a value of $3.8 billion. In third place is the New York Giants, who have jumped up one spot and are currently valued at $3.3 billion. Then we come to the fourth most-valuable franchise in the NFL, the Los Angeles Rams. That’s a bit of a shock when you look back five years ago and see the Rams all the way down at No. 29 overall (out of 32 franchises). Back then, the St. Louis Rams were valued at $875 million. Today, the Los Angeles Rams are valued at $3.2 billion. So, yeah, that’s why they were fine with tearing St. Louis fans’ hearts out. Back then, the Rams played in an aging stadium in a mid-sized market. Today, they’re playing in the No. 2 media market in the country and they’re about to play home games in a stadium that’s bound to rival Cowboys Stadium in terms of scope and value. It’s not just the Rams who are benefitting from relocation. The Raiders are feeling the bump and they haven’t even moved yet. The franchise announced it was leaving Oakland for Las Vegas a couple years back but the knowledge of what’s to come already has their valuation skyrocketing from $825 million in 2014 (dead last) to $2.42 billion now (18th overall). Just wait until the Raiders are actually in their state-of-the-art stadium in Sin City. That value is going to skyrocket even further. We would be remiss if we didn’t mention the Chargers as well. Back in 2014, the San Diego Chargers were looking at a value of $949 million, which was on the lower end amongst NFL franchises. Today, the Los Angeles Chargers (technically Carson but we’ll let it slide) are valued at $2.275 billion. 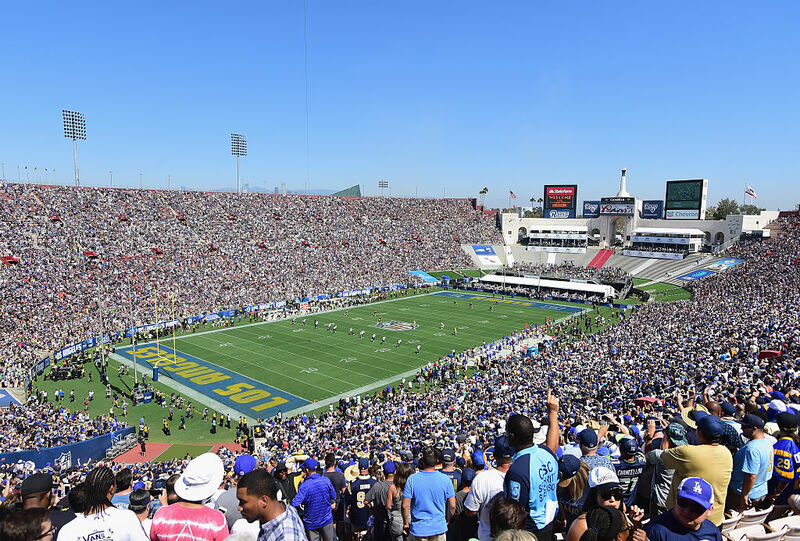 That still puts them closer to the bottom than the top but the team’s value is sure to rocket upward once they join the Rams in that new Inglewood stadium. If you’re looking for a glimmer of schadenfreude, you won’t find much of it here. About the best you’ll be able to do is muster a fist pump at seeing the Washington Redskins drop from being the No. 3 most valuable NFL franchise to the No. 5 most valuable. Though, your excitement should be tempered because while the team was valued at $1.7 billion back then, they’re up to $3.1 billion now.